The Tactical Girls calendar is great for a man-cave, garage or on a bunker wall at a Forward Operating Base. But a lot of guys also need a cool “work safe” or “spouse safe” gun calendar to hang at home or work. The Exotic Weapons Calendar will satisfy your monthly gun fix without landing you in the dog-house. The 2016 Exotic Weapons Calendar has photos, detailed specifications and interesting facts about 13 tactical weapons used by competitive shooters, law enforcement, military and clandestine special operations agencies worldwide. The 2016 Exotic Weapons calendar has the innovative FN F2000 bullpup, a rare suppressed Sterling submachine gun and the Surgeon SRL precision sniper rifle. Each month showcases a different weapons platform in a setting matched to the weapon with trivia from military, firearms and law-enforcement history. 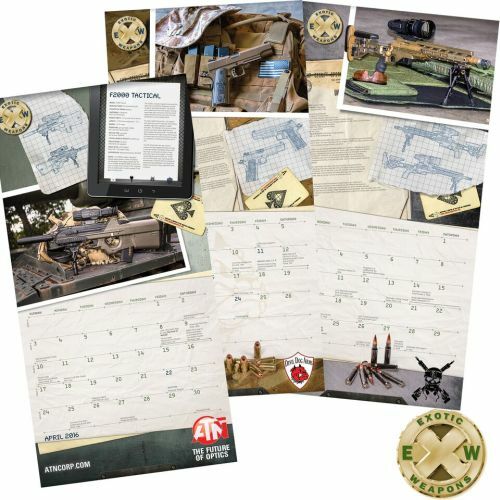 The Exotic Weapons Calendar a great gift for the Marine, Soldier, Sailor, Airman, Police Officer, Shooting Enthusiast, Hunter, Airsoft Player or History buff on your list. Each month showcases a different weapons platform in a setting matched to the weapon with trivia from military, firearms and law-enforcement history. 10% of the print run of this calendar is donated to deployed soldiers and organizations that support them, notably AmericanSnipers.org. 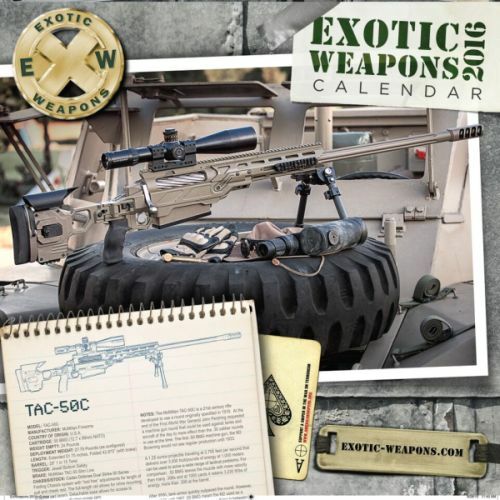 The Exotic Weapons Calendar a great gift for the Marine, Soldier, Sailor, Airman, Police Officer, Shooting Enthusiast, Hunter, Airsoft Player or History buff on your list..